How do the tweaks improve the most popular CSC of the past 12 months? Nikon was one of the last manufacturers to enter the compact system camera (CSC) market, launching the Nikon 1 system in September 2011. 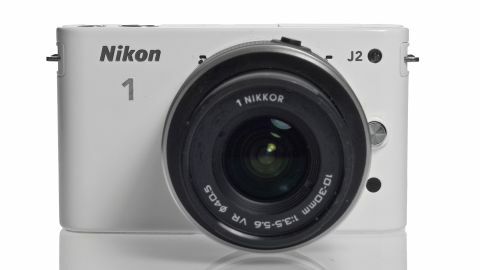 Unlike other systems, Nikon uses a smaller, 1-inch CX format sensor in the Nikon 1 J1 and Nikon 1 J2, which enables a smaller overall body size. Although it perhaps wasn't the system many were expecting from the company, it - or rather the Nikon 1 J1 - has performed exceptionally well, topping the CSC sales charts at several points in its 12 month history. In the intervening time since the Nikon 1's launch, we've finally seen what biggest rival Canon has to offer, in the shape of the Canon EOS M. Unlike Nikon, Canon has chosen to use a large APS-C sensor, the same device found in the Canon 650D, one of its entry-level DSLRs. Perhaps Nikon is keen to avoid cannibalising its already successful lineup of beginner and enthusiast-level DSLRs, but the Nikon 1 system is so far straying pretty far away from the full manual control, advanced bodies we're currently seeing from the likes of Panasonic, Fujifilm and Olympus. Less than a year after the launch, Nikon has already refreshed the J1 with the J2. It's more of a tweaked upgrade than a full-scale refresh, but still features a couple of notable improvements. Firstly, it uses the same screen as found on the higher end Nikon 1 V1, bringing it up to 920,000 dots, where the Nikon 1 J1 included a 460k device. Secondly, it's now much easier to access those all-important creative and manual modes, thanks to a new Creative mode that can be accessed from the mode dial. As of yet, we haven't seen an upgrade offered for the Nikon 1 V1. Since the compact system camera was not as successful as it had been hoped, it's a possibility that the camera will be discontinued altogether, perhaps to be replaced by a much more advanced model. Cosmetically, the Nikon 1 J2 remains pretty much identical. There are, however, some extra colour variations, with a couple of them featuring brushed metal and textured surfaces. The basic colours, such as black and white, remain exactly the same. Inside, you'll find the same 10.1 million pixel CX format sensor, which measures 13.2 x 8.8mm. This format means that mounted lenses have a 2.7x focal length magnification factor. Bundled as standard is the 10-30mm kit optic, which is 27-81mm in 35mm equivalent terms. Also exactly the same is the processor, sensitivity (ISO) range, and a high continuous shooting rate. A hybrid autofocusing system also returns, which uses both phase and contrast detection. Unlike DSLRs that use a dedicated AF sensor, the Nikon 1 J2 (and Nikon 1 J1 and Nikon 1 V1) use 73 pixels on the imaging sensor as phase detection AF sensors. Both contrast and phase detection is used, because although phase detection is generally quicker, contract detection is usually more accurate. Thanks to an electronic shutter, the Nikon 1 J2's continuous shooting rate, like the Nikon 1 J1's, can be pushed as high as 60fps, while 30fps and 10fps options are also available. Nikon continues to aim this camera - priced at around £550/$550 - at family and beginner photographers, emphasising the fully automatic modes and other appealing features. But P,A,S,M modes are still accessible.